Getting a facelift without surgery can be an appealing alternative for those not quite ready to go under the knife for a traditional (and traditionally taxing) surgical facelift. VIP Aesthetics understands that the goal of a facelift – be it traditional or a non-surgical – is to achieve a healthier and more youthful appearance. For many of our Fort Lauderdale based patients, non-surgical face lifts are a wonderful way to improve your skins overall appearance and tightness in noticeable ways without the invasive measures and drastic down time of a surgical facelift. Also, because a non-surgical facelift is a combination of procedure uniquely tailored to you and your skin, the effects are precise and show subtly to friends and loved ones whereas a surgical facelift can sometimes look too severe. There are various treatments available to achieve the desired result and Dr. Cosentino along with the staff here at our medical spa are proud to offer these cutting-edge techniques to you. With the VIP Non-Surgical facelift, we will rejuvenate your skin, improve the texture, smooth out rough features, tighten loose areas, clear out blemishes and reduce fine lines and wrinkles. The rapid growth in popularity of these non-invasive procedures, even when used separately, is a testament to the fact that they yield results and deliver in the promises of minimal pain and minimal downtime as you seek out facial renewal. Injectable Dermal Fillers and Botox: As many of you know, Botox and Fillers are often used in conjunction with one another to help treat wrinkles and creases. Did you know they can also be used to alter the fullness and shape of the mouth, change the angle of the brow and more? Botox is injected into the muscle to relax it and prevent it from making deeper wrinkles any worse. Fillers are used to fill creases and wrinkles as well as any spot that may be losing fullness due to age, weight loss, stress, etc. Trinity: This is actually a combination of three and advanced skin renewal techniques. They include laser skin tightening to eliminate even more fine lines and loose skin, an IPL photofacial which uses light to even out your skin tone and remove various imperfections like sunspots and acne scars. Finally, our Syneron® lasers are used to target pigment, rosacea, spider vessels and more to really give your skin a clear and youthful appearance. PCA Peels: Lastly, we finish off your non-surgical facelift with a series of 4 PCA chemical peels and microdermabrasion treatments designed to slough away dull, dead skin cells and superficial blemishes, irritations, discolorations and other damage. The peels and microdermabrasions clear away the thin outer layer of skin to reveal the freshest face possible. Obagi: As an added bonus, we give you a range of the Obagi Nu-Derm® products to help you maintain your beautiful new face in the same way that the professionals would. As you can see, VIP Aesthetics has developed one of the most advanced and comprehensive facial rejuvenation systems possible. 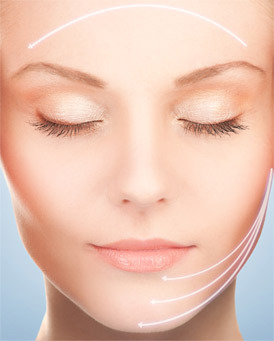 Best of all, these treatments are painless and free of the costly down time that a surgical face lift requires.